, of Hereford, as he usually styled himself, a poet and schoolmaster, was born in that city, and sent when young from a grammar-school there, to the university of Oxford; but Wood has not discovered in what college he studied, nor does it appear that he took any degree. After leaving the university, he returned to his native place, where he obtained the character of a poet, and published several productions of the rhyming kind; but not finding, as it would indeed have been wonderful if he had found, much profit accrue, he set up a writing-school, first at Hereford, and afterwards in London, where he at length acquired the character of one of the first penmen in England. In 1611 we find him living in Fleet-street, and a Roman catholic. From Peck’s Desiderata it appears that Arthur Wilson was one of his pupils, and that the conversation of Davis and his family inspired him with some doubts of the religious kind. 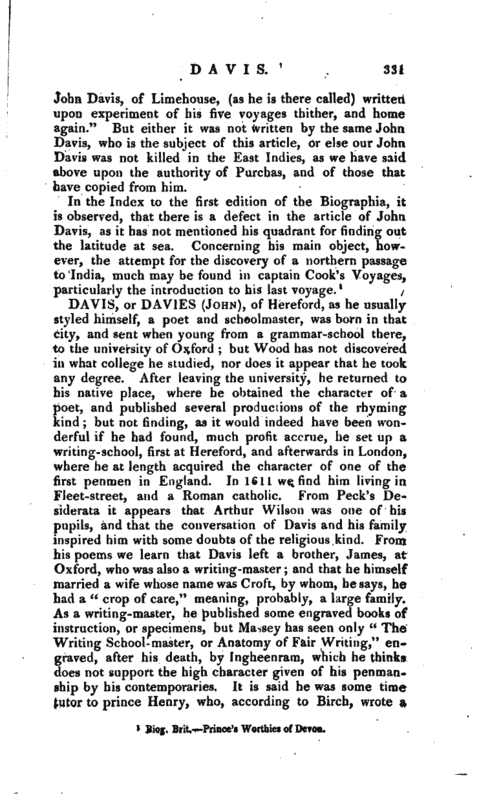 From his poems we learn that Davis left a brother, James, at Oxford, who was also a writing-master; and that he himself married a wife whose name was Croft, by whom, he says, he had a “crop of care,” meaning, probably, a large family. 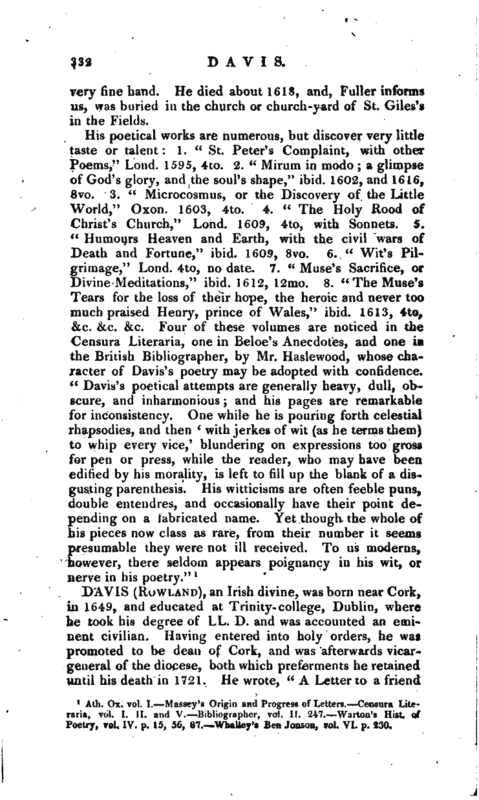 As a writing-master, he published some engraved books of instruction, or specimens, but Massey has seen only “The Writing School-master, or Anatomy of Fair Writing,” engraved, after his death, by Ingheenram, which he thinks does not support the high character given of his penmanship by his contemporaries. It is said he was some time tutor to prince Henry, who, according to Birch, wrote a | very fine hand. He died about 1618, and, Fuller informs us, was buried in the church or church-yard of St. Giles’s in the Fields. Ath. Ox. vol. I. Massey’s Origin and Progress of Letters. Censura Literatia, vol. I. II. and V. Bibliographer, vol. II. ’247. Warton’s Hist, of Poetry, vol. IV. p. 15, 56, 87. Whalley’s Ben Jonson, vol. VI. p. 230.